Happy Monday! I think all crafters can relate to the inspiration of everything rainbow! The Lawn Fawnatics Challenge Blog turns one and the inspiration for the challenge is color inspiration! 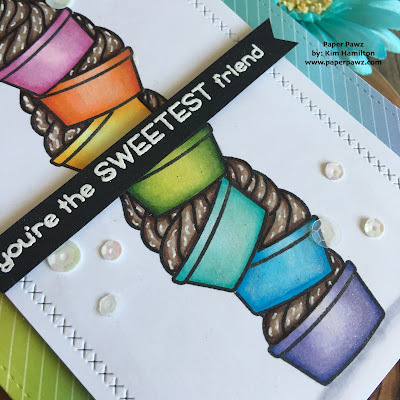 I was lucky enough to take a class taught by Jenn Shurkus over the weekend at my local scrapbook store - Scrapbook Centrale aka my happy place! I can see why she decided to start teaching full-time, she is gracious and patient and really takes the time with her participants. I have recently begun teaching myself and I am so happy I went, you learn from someone like her - her personality and passion are infectious! Not only did I go rainbow I went with wonky Fro-Yo! I just felt like having fun with this project. 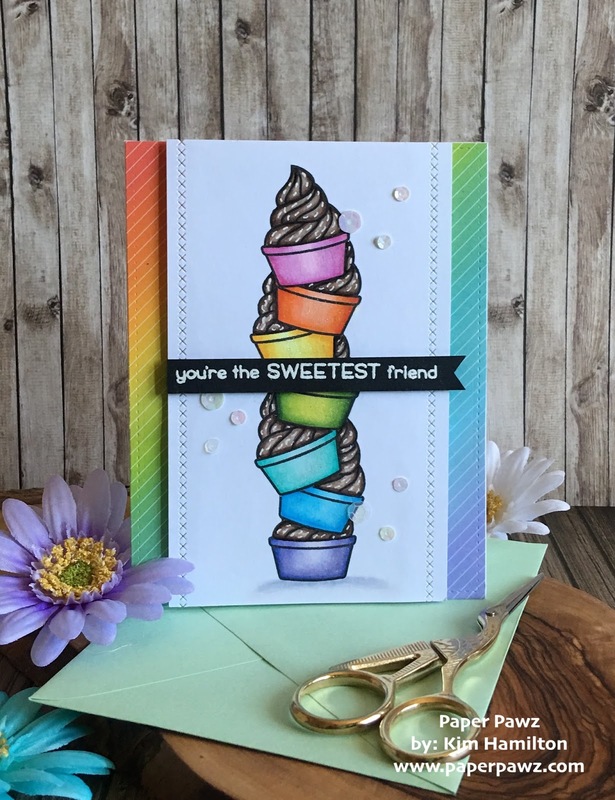 What better than pile of rainbow frozen yogurt from the Sweet Friends stamp set. I stamped my first image on the top and re-stamped it on a sticky PostIt note and fussy cut my mask. I place it on top of the first and continued down, I did need to cut a second mask but not the whole image just the cup. Once I was done I used my Copics to color the images. 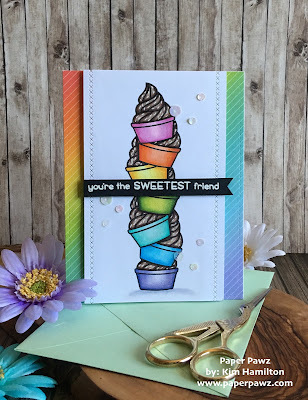 I then chose one of the fantastic Really Rainbow Petite 6x6 papers for the background and die cut that using my largest Stitched Rectangle die. I cut down my A2 size panel with the frozen yogurt and decided to add a little detail by using one of the stitched border dies. I then added "sprinkles" to the frozen yogurt using my white Gellyroll pen. 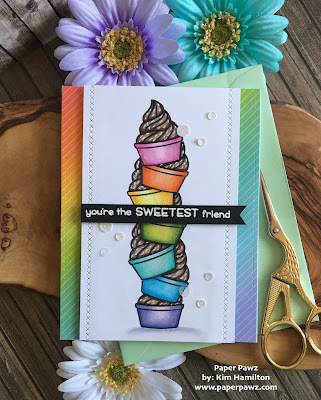 I put my card together and stamped the sentiment also from the Sweet Friends stamp set on Lawn Fawn black card stock and white embossed it. The sequins are new from Studio Katia and they have a really pretty iridescent finish to them. 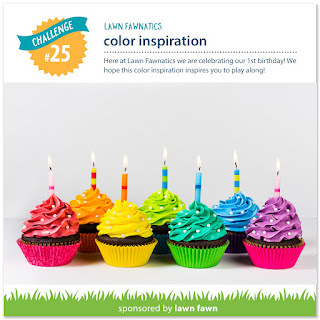 Go check out the challenge, they always have super fun themes.